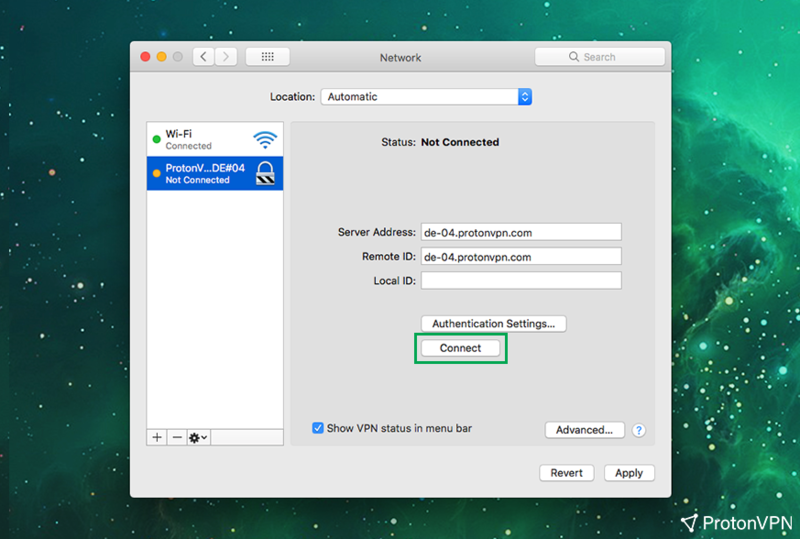 You can connect to the ProtonVPN servers by either using TunnelBlick (it uses OpenVPN), our application for macOS or connect manually via IKEv2 protocol. The manual connection won’t have additional features and this connection method is only available on Mac OS X 10.11 (El Capitan) or newer macOS versions. 2. 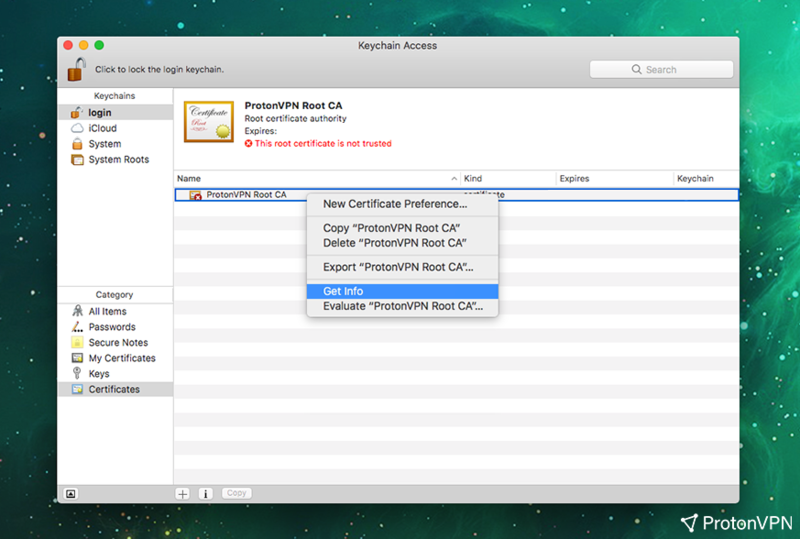 If you are using macOS 10.13.x, the certificate will be added automatically. Otherwise, click on Add in order to add it to the keychain. 3. 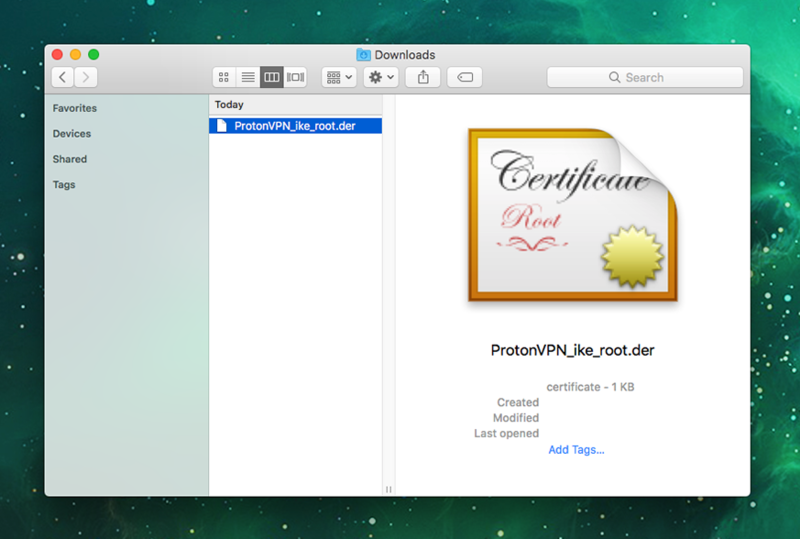 Right click on ProtonVPN Root CA certificate and then click on Get Info. 4. Select Always Trust in the When using this Certificate field. 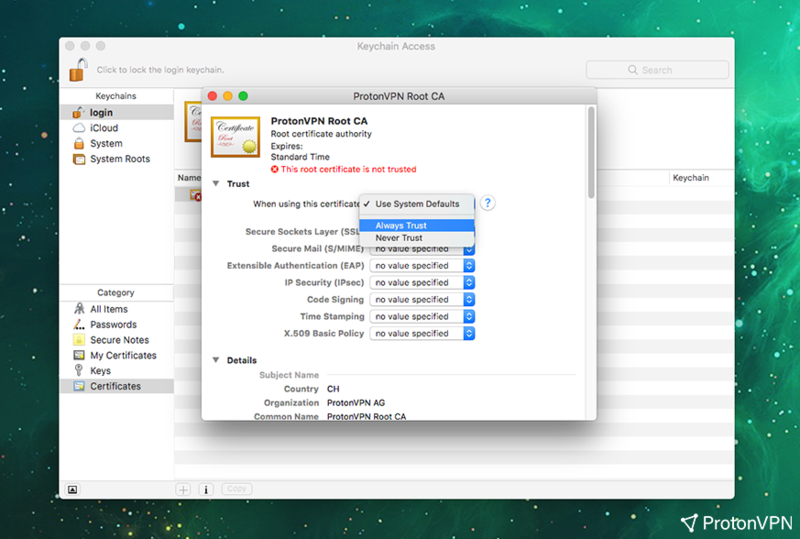 Enter your Mac password when prompted and close the keychain window. 5. 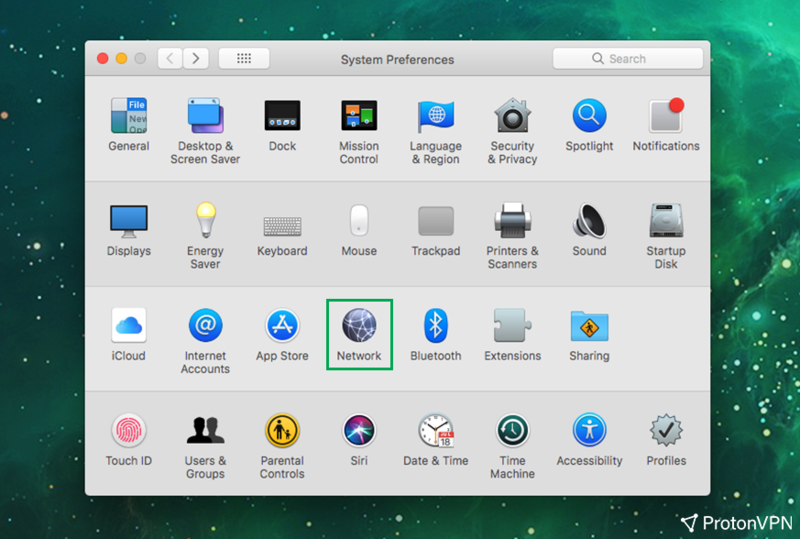 Open System Preferences and then open Network. 6. 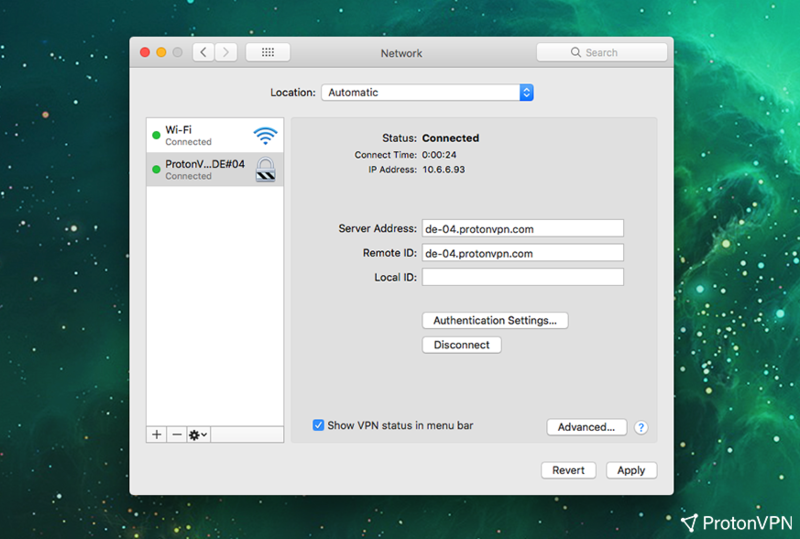 In the Network window, click on the Plus icon at the bottom-left corner. 7. 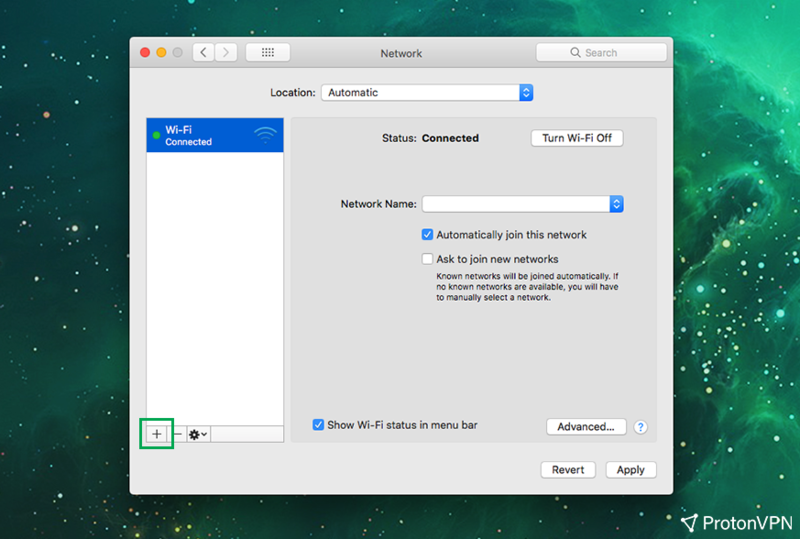 A new network setup window will appear. 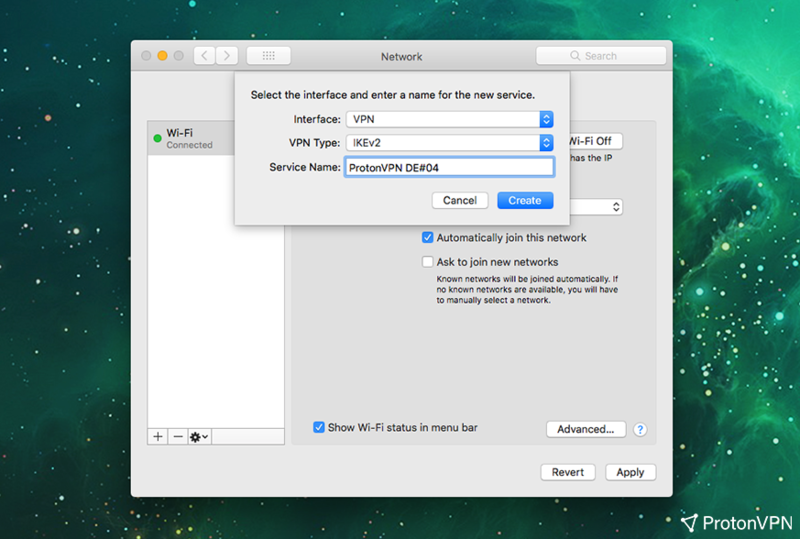 Select VPN in the Interface field, IKEv2 in the VPN Type field, name Service however you like and click Create. 9. Click on the Authentication Settings… and enter your OpenVPN/IKEv2 credentials, you can check them in the Account section: https://account.protonvpn.com/settings. Afterward, click OK.
10. Click Connect and Apply once this screen is prompted. 11. You should get connected now. You can disconnect from the Network screen or VPN status bar at the top right of your screen. Would it be possible to generate a .mobileconfig file for macOS / iOS users? Or publish the exact VPN configuration details (like IKEv2 & Child Security Association Parameters, Certificate details, Connection details such as Perfect Forward Secrecy etc.)? i need to connect with ip address instead of hostname on ikev2. can you change your config server to provide this option? Hey Aras, shoot us an e-mail via https://protonvpn.com/support-form if you need server IP addresses. Also, you can ping the server hostname, which is listed in the OpenVPN Config file, though it might not be the most convenient way to get IPs. We are planning to list hostnames on our website in the near future as well. It would be nice if you said it only works for paid servers. Hey Bob, this method for free servers requires a server IP address. For example ping us-free-01.protonvpn.com and use the IP address you will get instead of the hostname.